Back to the Future: Project! is a 2-day festival for analogue moving images and optical sound; a celebration of the analogue film with an international programme of audio-visual performances, films, presentations, lectures and installations. Back to the Future: Project! focuses on the future of the film medium, in terms of contemporary artistic developments embedded in a historical context. The full 2-day programme is via http://filmwerkplaats.org/?back-to-the-future . Know thy instrument: recreating 16mm film projectors as sound producing devices. A composition for a multiple projector performance setup created by Dutch artist Mariska de Groot where the rattling apparatus with its optical sound loops functions as a musical instrument and the projectionists serve as musicians. Many years in the making and now for the first time to be presented in public! An installation with a complex machine of eight completely synced up 16mm projectors loaded with a five minute film loop, projecting a continuous image of eight successive actions progressing through time. The result is a fascinating counterpoint panorama. (You could also call it a time machine.) You really have to see it to get the picture. In the works of Guy Sherwin & Lynn Loo sound and image are truly in a physical correspondence: what you see is directly connected to what you hear. 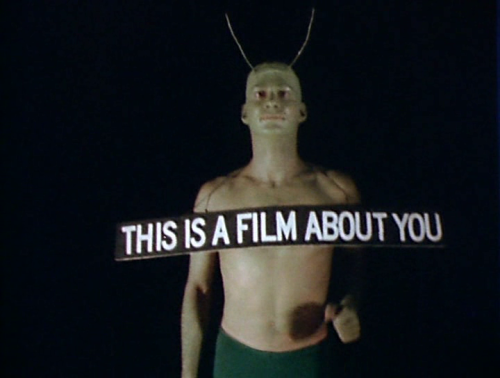 Researching all the different translations of visual information carried by a filmstrip, Guy Sherwin created some of the most joyous avant-garde films from the 1970s. Alongside these optical sound films and the 16mm version of the performance-in-progress, Man with Mirror, Sherwin, together with Lynn Loo, will perform Cycles #3 and their brand new work, Washi MM. Sally Golding combines film projection, lighting and sonic composition to create expanded cinema performances and participatory installations. Goldings performances are cacophonic and hallucinogenic fields of intensity, which transcend flicker, waveform and light. In WORM, she will present her latest performance piece Light Begets Sound: a durational phasing of projector and LED light articulated through software and custom built light sensitive instruments. Anja Dornieden and Juan David González Monroy are filmmakers living and working in Berlin and members of the artist-run film lab, LaborBerlin. They have been working together under the moniker OJOBOCA since 2010. Together they practice “Horrorism”, a simulated method of inner and outer transformation. At Back to the Future: Project! they will present their latest film ‘Heliopolis Heliopolis’, and the highly acclaimed performance ‘New Museum of Mankind’.